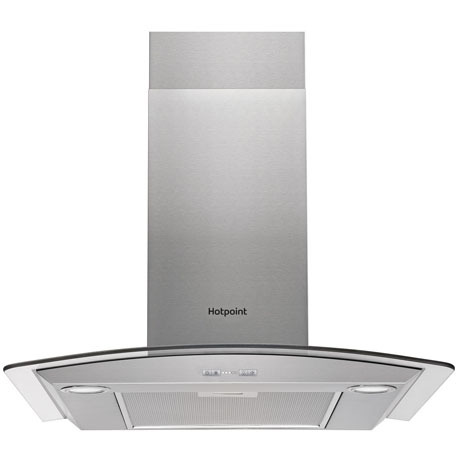 This Hotpoint Cooker Hood makes cooking odours a thing of the past with this brilliant chimney style, curved glass hood. It’s ideal for moderately sized kitchens, as it can clear 432 cubic metres of air every hour. Measuring 70cm wide, this model is designed for use above any standard-sized cooker or hob. Eye Catching and super stylish, This Hotpoint Curved Glass Hood provides function and adds fashion to every kitchen design. Featuring three speed controls plus booster, the physical button control puts the power at your fingertips. Two halogen lights provide ambience and ideal illumination over your dishes. Using charcoal filters to catch grease and food splashes this hood prevents unnecessary build up. This model also comes with a Silence Button for when extraction risks interrupting conversation and a display message for when your filter needs replacing. All in all this chimney style, curved glass cooker hood from Hotpoint is a good all rounder and will suit your extraction needs perfectly.